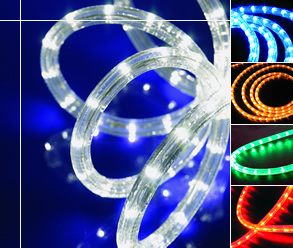 LED Instant Flexilight is LED Rope Light. 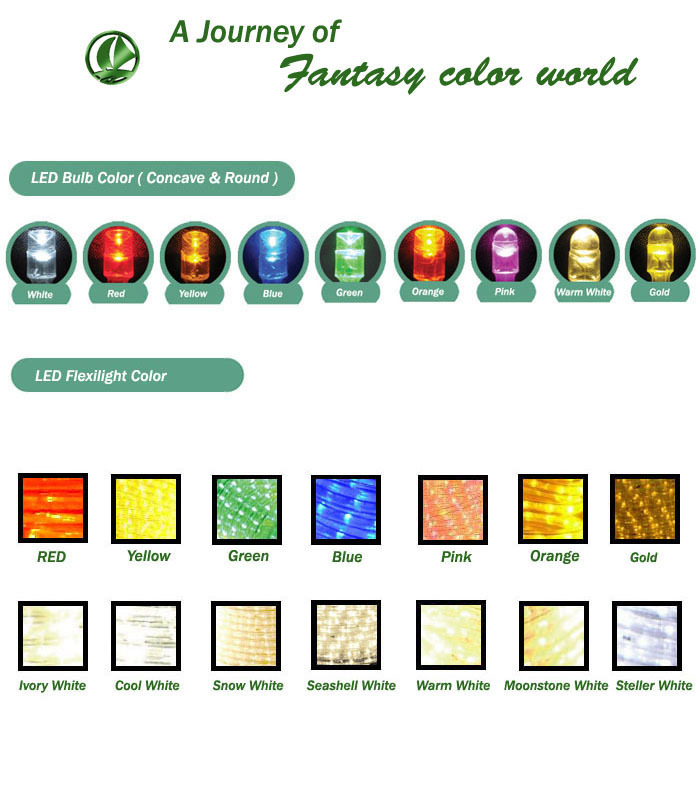 Flexilight with LED (Light Emitting Diode), instead of filament, is power-saving and causes no heat dissipation problem. LED features for mechanically robust and functionally life up to 100,000 hours. No bulb replacement for 10 years plus. This is not a cost consideration. For connecting Flexilight to the power source. Cords and plugs meeting different safety standards are available. Splice Connector F3 Traditional screw-on type plastic connector between 2 pieces of Flexilight. End Cap F45 In a segment of Flexilight, one end is the power cord, the other end must be covered with an End Cap to prevent the user from touching the tin wires carrying electricity. Tie Strap F5 For fixing Flexilight on a grid, a rope or a frame. F62 Nailed on wood/stone/concrete surface, or sticked on iron/glass surface, allowing Flexilight to be easily snapped in. Suction Cup F7 Used with Tie Strap, for fixing Flexilight on a smooth and flat surface. F83: 3 Ft Indoor/Outdoor U-shaped clear channel nailed on wood/stone/concrete surface, or sticked on iron/glass surface, for fixing a straight line of Flexilight. Easy Splice Connector F9 For connecting 2 pieces of Flexilight in a less visible way, usually used together with a shrinkable tube to seal the connection. Y-Cord F10 For connecting 2 pieces of Flexilight to the same power source or controller. T-Connector F11 Traditional screw-on type plastic connector for joining 3 pieces of Flexilight into a T-shape. Housing Clamp F14 Strong weatherproof connection between 2 pieces of Flexilight. The Housing Clamp needs to be filled with silicon glue and tightened with screws.Users can assemble the Housing Clamp themselves. PVC T-Connector F22 Same function as the T-Connector, except that it's made of clear PVC without the screwlike connection. PVC X-Connector F23 Made of clear PVC, for connecting 4 pieces of Flexilight in a cross-section. F18: 6 Ft between ropes For enlongating the length between Flexilight and a power cord.